February is the high season on the Virgin Island of St. John. Our beaches are full and the usually quiet island bustles with thousands of visitors and more special events and activities than islanders can take advantage of. Two February occasions embody St. John’s happy, healthful and busy high season: The romance of Valentine’s Day and the island’s growth as a wedding destination; the 8 Tough Miles race that begins and ends at sea level but reaches an elevation of 999 feet and attracts hundreds of marathoners each year. Virgin Island wedding festivities have long been simple and joyous. A couple of goats, a few demijohns of rum and cakes would be required for a wedding feast typically attended by 20 to 100 people. A traditional wedding cake is a Black Cake made of flour, brown sugar, butter and available fruits. The dried fruits are soaked in rum for two or more weeks and the cake is served with a hard rum sauce. Typical main courses could be curried goat or spicy chicken jerky served with fried plantains and other side dishes. Long-time British Virgin Island resident Andria Flax (in her memoir “The Way We Were”) recalled that people at the wedding feast who went back for seconds or thirds were called “raven” (short for ravenous). And, of course, “invited guests are treated best.” Cane rum and Mordecai wine (made from red and black berries and spices) “flowed freely,” she recalled. Romance continues to be “a perfect match” with the Virgin Islands says Beverly Nicholson-Doty, the U.S. Virgin Islands’ (USVI) Commissioner of Tourism. “Greater accessibility to our islands, coupled with no need for a passport for U.S. citizens, makes this a key market for the Territory,” she says. Among the leading all inclusive VI resorts hosting weddings are The Buccaneer on St. Croix, Marriott’s Frenchman’s Reef Resort and the Ritz Carlton on St. Thomas and Caneel Bay Resort on St. John. 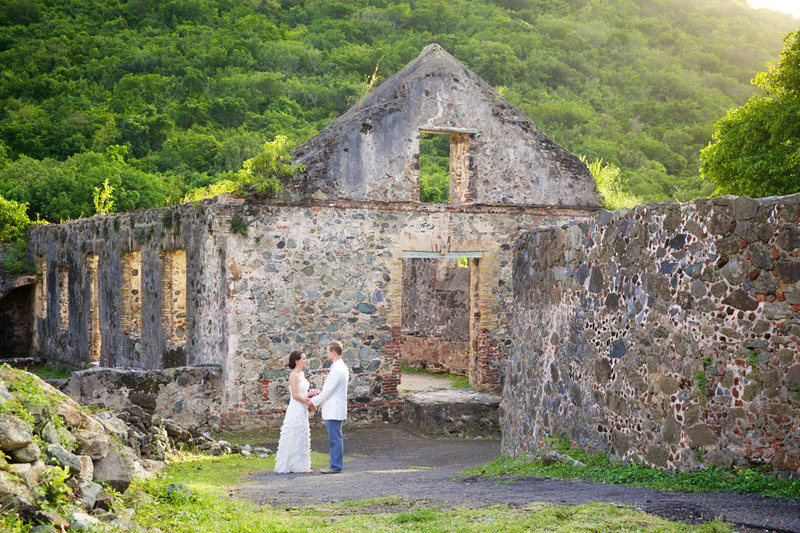 Outside of hotels, though, the island of St. John — with the Virgin Islands National Park comprising two-thirds of its land — offers majestic landscapes, some of the world’s most beautiful beaches and picturesque historic sugar plantation ruins as wedding ceremony venues. Anne Marie Porter, a non-denominational wedding officiate known as “St. John’s Barefoot Minister,” has been helping visitors marry on St. John for more than 20 years. She has organized and officiated at weddings on famed beaches and in the ruins of the Annaberg Sugar Plantation, built about 1800 by Danish colonists. Ms. Porter’s website (stjohnweddings.com) provides a Virgin Islands marriage license application (no residency requirement, no blood test, no waiting period) and other valuable information. 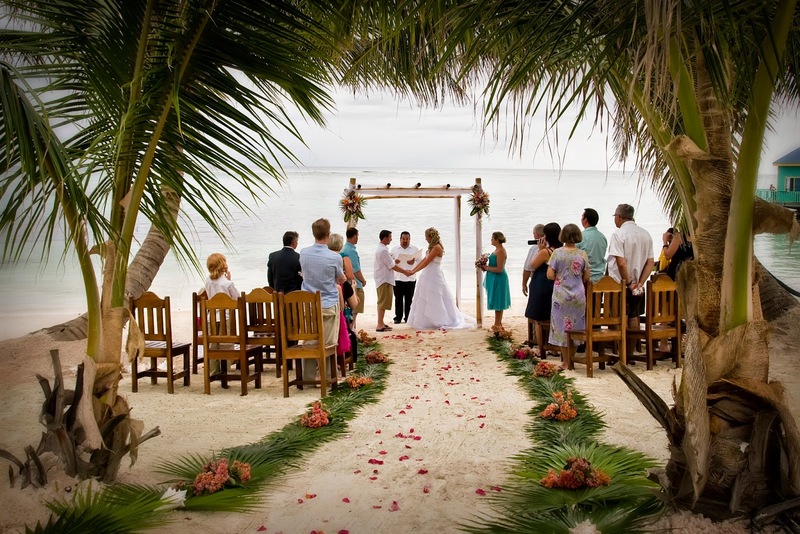 Each Valentine’s Day, she also arranges a renewal of vows ceremony held at 5:00 pm on the National Park’s Trunk Bay beach. The cost is free and between 75 and 100 couples usually participate. Last year, married couples from towns as diverse as Boulder, Colorado, Pass Christian, Mississippi and Reston, Virginia renewed their oaths in the sand. “Although several experienced island wedding planners stand ready to assist, unlike most Caribbean destinations, St. John remains mostly a ‘do it yourself’ island and that stimulates event creativity and use of local resources within our unique culture,” says Tyler Anderson, President of Catered To Vacation Homes, St. John’s leading villa management and booking company. “We love to accommodate families gathered for weddings.” With 47 villas under management, Mr. Anderson says he can arrange for a large wedding party to occupy more than one villa — often within walking distance of each other. “Receptions are typically held at restaurants and groups, which have the infrastructure to handle large parties,” he explains. Wedding parties often organize group boat charters and other activities. Catered To works with its own wedding consultant to help villa clients manage the details. Although relatively small islands, the USVI have talented photographers, videographers, musicians and other performers experienced with weddings. For those wishing a traditional religious ceremony, clergy from Catholic, several Protestant and Jewish congregations are happy to officiate. Of particular note among the VI’s historic houses of worship is St. Thomas’ synagogue. Constructed in 1833, it’s the oldest synagogue in continuous use under the American flag and the second oldest in the Western Hemisphere. Although romance has flourished on St. John for more than two hundred years, 2017 marks only the 17th year in which the 8 Tough Miles foot race has been held. On the event website (8tuffmiles.com), founder Peter Alter says the race — held annually on the last Saturday in February (this year, on the 26th) — grew from a solo run he made from Cruz Bay to Coral Bay back in 1996 when he was trying to quit smoking. Although the race begins and ends at sea level, the 8.36 mile course traverses St. John’s central hills with the highest point reaching 999 feet. Mr. Alter likens it to walking up the Empire State Building’s stairs to its 86th floor observatory. Once you make it, he asks, “Which location provides the better view?” Personally, I choose the St. John pinnacle view of all of Coral Bay and the green mountainous British Virgins of Norman, Peter and Salt Islands, part of Tortola as well as the multiple shades of blue provided by the Caribbean Sea and sky. Most St. Johnians participate in 8 Tough Miles. They run or line portions of the route to encourage runners. 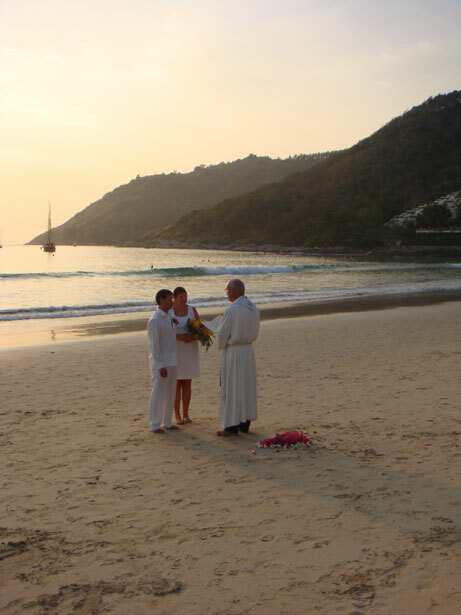 St. John weddings also garner the interest and support of St. Johnians who must be somewhat romantic to live there.